Long before it came out I knew that the Brave Blu-ray would be a welcomed addition to my growing collection. 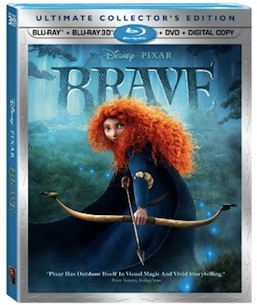 Brave was one of my 3 favorite movies to be released this year. It’s not really hard to imagine I, a self affirmed Disney and technology geek, might like a digitally animated Disney film that contains within it a few new technical leaps forward. And on top of it has one of my favorite movie soundtracks to be released in a few years - the spirit of the movie and Merida’s freedom shine through and make it excellent running music. If you want to hear more specifically about the movie please check out Disney Film Project Podcast - Episode 78. Alone the two shorts on this Blu-ray are worth it, though for different reasons. La Luna is a short that speaks to me in a very beautiful way, and I’m glad to own it. Everyone has their own story about finding their own way in life, and this story tells one that is very special and... well... stellar. The other is title The Legend of Mor’du is one that is purely for the fans of the world and lore of Brave. Hear the legend of the great black bear told all over again from the perspective of the Witch. I wonder who’s listening. Then there’s several behind the scenes features like Brave Old World which tells the story of the research trip taken by Brave team members to Scotland. It really shows the love and appreciation of the country that they reflected in the movie. There are other shorts that go on to discuss things like the relationship of Merida & Elinor, the realism of the Bears presented in the movie, and one called Brawl in the Hall which about the fight scenes in the castle hall and how they were created, what they represent in the story, etc. Then in Clan Pixar we learn about all the fun ways the Pixar team celebrated the movie like Kilt Fridays and celebrating with Haggis. There’s also this great piece Once Upon a Scene where we get to see scenes that never made it to the movie brought to life using storyboards. I’m always a fan of learning about the history of a movie’s production in this way. There’s extended versions of a number of scenes in the movie. Nothing too earth shattering, but you do get a really good picture of how a scene progresses over time, and how a few small edits can take something from terrifying to just scary. There is also an audio commentary track, which I have not had time to listen to yet, by Director Mark Andrews, Co-Director Steve Purcell, Story Supervisor Brian Larsen, and Editor Nick Smith. Usually there’s a lot of good information inside these and also perspective as to why certain movie elements were presented to us the way they were. Looking forward to getting around to listening to it. If all this weren’t enough, there’s a whole second “Bonus” Blu-ray containing still more content for fans to absorb. Included is the original opening to the movie that was scrapped because it didn’t include the films main protagonist, Merida, though parallels exist. Also cute is a piece called Fallen Warriors that is just small, seconds long pieces that were cut from the film. A discussion called Dirty Hairy People which is about the hygiene of the people of medieval Scotland. Another piece is about the use of Scottish actors as much as possible when making the movie. Then there’s a piece about Merida’s horse, Angus and another about The Tapestry. Also provided are all the various domestic and international trailers that were shown in theaters, online, and on television. However, the most amazing content to be found on the Blu-ray is called the Art Gallery. Literally hundreds and hundreds of pieces of artwork that were created during the production of Brave. From patterns used in stonework, to maps of the castles, to design work for Merida, and beyond. If you watch all the video content first you will realize you saw some of this being created in those videos. This Blu-ray release is very strong. One thing I believe is that a fantastic movie like Brave should be made even more fantastic by the content it’s presented with for home ownership. This Blu-ray release lives up to that, as it’s really a good example of how to properly use the medium to present the owner with some great additional content. I’ve still not had to time to really explore all of the Art Gallery, there’s just so much there to absorb. Fans of this movie will be instant fans of this Blu-ray release, and if you’re looking for a family movie to enjoy at home over the Thanksgiving weekend, this is it.